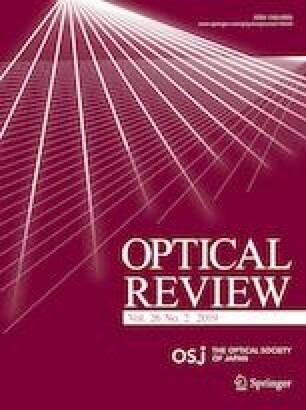 The application of freeform surface in an optical system can effectively increase the freedom of optical design and reduce the number of optical elements. In this work, a two-mirror off-axis sparse aperture telescope is proposed. The primary mirror is made of three sub-mirrors arranged in the Golay3 configuration while the secondary is a freeform surface defined by a polynomial of two variables X and Y. The off-axis configuration is used to remove the obstruction of the secondary mirror. The results indicate that the fill factor of the Golay3 primary mirror increases to 58.4%, which is significantly higher than that of the on-axis configuration. The image quality is improved within 2.5° full field of view from its spot diagram, distortion, modulation transfer function, and encircled energy. This work is supported partially by National Science Foundation of China (NSFC) (61875145, 11804243); Jiangsu Province Key Discipline of China’s 13th 5-year plan (20168765); Jiangsu Key Laboratory of Advanced Optical Manufacture Technology (KJS1710); Suzhou Key Laboratory (SZS201611, SZS201712); and the Six Talent Peaks Project of the Jiangsu Province (DZXX-026). The authors are also grateful to Professor Qian Lin of Soochow University for valuable advices and to Dr. Cao Zongjian of Augusta University in USA for editorial suggestions.